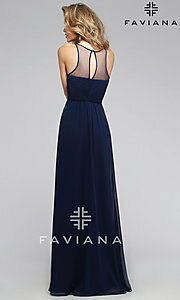 This romantic long formal gown by Faviana is tasteful and classic with Grecian inspired figure-flattering beauty. This floor length sleeveless dress incorporates an elegant illusion high neckline over a ruched sweetheart bodice for the best of both worlds. The surprise back keyhole adds the final flirtatious hint of skin that makes this illusion high neck gown unique and perfect for your formal event.